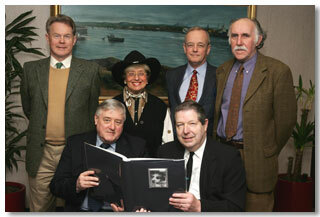 The founding trustees in 1999 were Dr Tony Sutton, chairman; Mrs Jean Stevenson, treasurer; Dugal Beedie, secretary; Dr Andrew Orr, Councillor Kitty Ritchie; Jonathan Stansfeld; Alan Doe; and Graham King (who has since left Montrose). Sandy Munro joined the committee in 2005. Its objective as a charitable trust was to embark on the more capital intensive projects, and the initial task was to look at the possible acquisition of a 17th century merchants town house as a tourist attraction. This did not come to fruition, but it has since commissioned a professionally made promotional video of the town 'Destination Montrose', due for updating in 2007, before embarking on the ambitious aim of raising £50,000 for the Bamse statue. Mrs Henny King was seconded to the team having brought the story to our attention, and also because of her great experience as a fund raiser, and Dr Orr took on the role as the Bamse Project Director. The statue was erected in October 2006, but the development of the website, publication of books on Bamse, and other aspects of the project will be the Trusts main tasks for the foreseeable future.